Eat as the Romans do on this small-group walking food tour of the Eternal City. Follow a foodie guide to some of the city’s best eateries for an authentic taste of regional cuisine, from savory eggplant parmigiana, pasta, and pizza to decadent gelato and cannoli. Learn about artisan production and Roman culinary traditions as you visit award-winning restaurants, cozy cafes, and the city's oldest food market. Meet your gourmand guide at the Cipro metro station, and begin the tasting tour in true Italian fashion with a cappuccino and handmade cannolo (marscapone-filled pastry) at a Sicilian cafe. Properly caffeinated, continue on to Rome's biggest and oldest food market, where you can browse bustling stalls and see where locals go to shop. Learn about Rome's culinary heritage and meet vendors as you taste popular regional dishes like mozzarella di bufala (buffalo mozzarella) and melanzane alla parmigiana (eggplant parmesan). Take a digestion break on the walk to an authentic pizzeria, considered to be the city’s oldest and best according to international food bloggers. Enjoy a slice here before heading to an award-winning restaurant to taste three different types of freshly made pasta paired with wine. Finish on a sweet note with a scoop of creamy gelato and a lesson in artisan production methods. 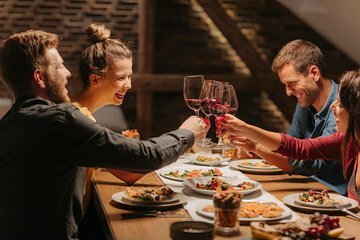 Be sure to bring your appetite, as you can expect to visit as many as seven different venues and indulge in at least 18 different tastings of food and wine during you tour. Buon appetito!